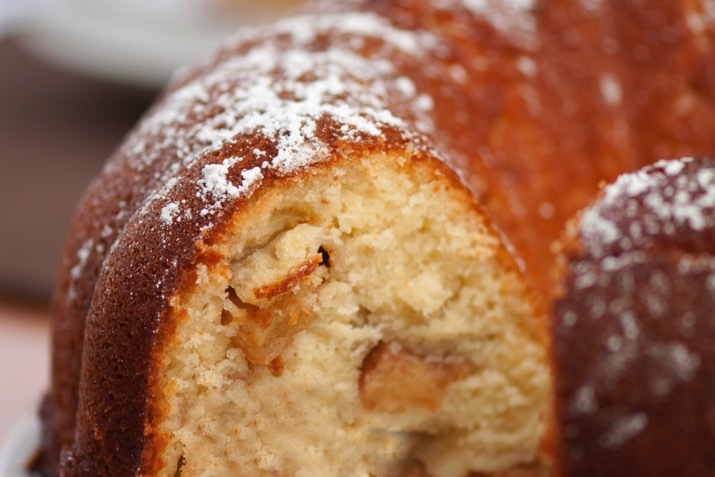 This delightful, nutty apple cake is perfect for casual gatherings. Try it topped with a maple syrup glaze, too. To make the pecan filling, mix together the pecans, sugar and cinnamon in a small bowl and set aside. For the cake batter, whisk together the flours, sugars, salt, baking soda and spices in large bowl. In a separate bowl, mix together the eggs, oil, applesauce and vanilla. Add the wet mixture to the dry ingredients and stir just until blended. Fold in the diced apples. Perfect for a casual gathering, this cake is extra-special when glazed. Just mix together 3/4 cup powdered sugar and 1 tablespoon each of maple syrup and apple juice (or milk) and drizzle it over the cooled cake. Top with chopped pecans if desired.